A mouse tail. A poem by Ruth. 'tis as long as yer head, an' double as wide. sittin' there pretty, 'spite a sick looken' gut. a retired kids pet in ya posh little house. and sorry 'bout the night you were left locked with the cat. The kids loved you dearly, I can tell you this Rose. don't worry, Rosie... we have a new rule. "Sit quietly! Speak gently! Give her some peace!" No more holding, no pockets... it all has to cease. Our dear Rosie is old, she's some to her last. Her busy pet duties have all come to past. Ahhhhh, Rosie, isn't it lovely 'n' quiet? and you with your ladder and rice cracker pieces. You know how sometimes somebody says something to you....and it kind of sticks with and you find yourself thinking about it vacantly? It was a strange conversation to have, in a way.... people who know me well know that I'm pretty straight laced about all this mystical stuff. I just don't know a lot about it, and never been compelled to learn. Having said that here is a picture that has been sitting here with me that was drawn by my young son just before Christmas. Leading up to this drawing, D had only scribbled occasionally. He's not really into it. 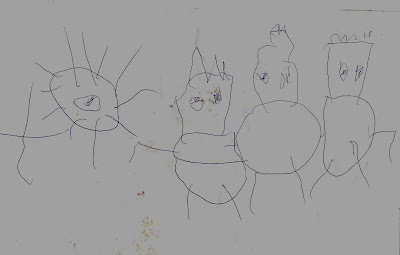 A few eye-dots here and there... punching holes in the paper with a pencil....typical 3 year old art. Paper and pencils are always on hand for the kids... but sadly no more pictures from D.
Could I possibly dare to even imagine this could be a Christmas card from heaven? 2008! Who can believe it. I remember sitting in school working out how old I would be in the year 2000! sheeeeesh! Looking forward to it though.... should be a great year. Happy new year to all who log in... (well... to everyone, really!) May this year be full of happiness and love. Pictured: Sheepychic roving : "Ocean Sweep" 111 gms. pictured: Sheepychic Rovings : "Under currents" 117gms. Pictured : Sheepychic roving "Steely Ann" SOLD..
All new Sheepychic... and a Lambzo update. I've been running back and forth a lot out to the line... hanging up freshly dyed rovings and newly spun yarns. hehe... Lambzo is an absolute shadow. It is usually lovely, but at times I was tripping over him... and at one stage shoo-ing him from the kitchen! I couldn't help but drape some yarn over him as he was literally between my feet when I was trying to take shots for the blog. It's a cute photo, I guess... but I like the way the photo shows the quantity of yarn in my hanks. Having Lambzo come into our family has been one of the best experiences ever! He is absolutely adorable and so loved! I just can't wait to spin some of his fleece when he's older. Hehe.. Sheepychic O'Lambzo! To finish up... a sneaky peek at some Sheepychic Rovings. I'll post a few for sale over the next week or two. All the best, and thanks for logging into Sheepychic Bloggings. Many thanks, Ruth. Any enquiries please email sheepychic@hotmail.com. Hi all... thanks for logging in again, especially as I've been down so long. I guess these things happen. I was lost without a P.C. for a while, but then again... more time for spinning! !~ Of course I would be spinning more if not for Lambzo... I find myself outside just hanging about with him... hehe..
Hi folkes... I'm posting from a friend's computer. My computer is outa action. I'll be back as soon as I can. You can still email me and I'll be in touch as soon as I can. All the best, Ruth. New!! 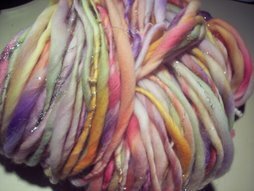 Sheepychic hand dyed milled yarns! With all of my spinning demo's finished up for the winter, I've had a couple of weeks off, which has been great. It seems the kids and I are making up for lost Saturdays, too.... with three trips to the zoo and a trip to Melbourne's wonderful Scienceworks... phew! It sounds a lot, but who likes to rush the kids through the zoo? We're happier to split it into a couple visits... If you've never visited Scienceworks it's wonderful! B was lucky enough to be plucked out of the crowd to be the helper for the lightning show. I must admit I was a little worried to watch static electricity running through my daughter...hehe. Her hair went up and the confetti in her hand was flicking up like a little fountain. Brave thing, she is! My wheels have also been busy... I've got a soft spot for Sheepychic handspun "Bourke 'n' Wills". I've named this yarn after Bourke and Wills because I've used some colours of the outback... russetty reds, clear sky blues and warm yellows. I've plied over with a gold thread which is really pretty, and I also made a hank with simple yellow machine thread, leaving the yarn a nice matt, subtle yarn. This yarn was fun to make! I spun it off for a demo. when I was at the Point Cook Homestead. I've handdyed the Merino rovings into a polar blue, Rye and white. I stripped the roving through so I could separate the colour and keep a little uniformity, and when I hit the white or there-abouts I draped though some shimmering "Firestar" I bought from EGMTK's. I then plied the whole lot back with a earth coloured thread just to highlight the rye-tones a little... A very special hank. I love this! Plan, Dye, Spin, Knit...If the idea of your own Sheepychic Hand spun Winter Beanie warms you...feel free to email! Made with hand dyed, hand spun Sheepychic yarns. 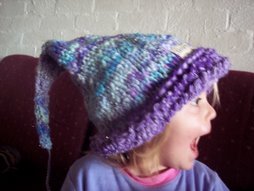 Mandie's blog at "ewe give me the knits"
Spoil yourself...order a Sheepychic yarn of your own.